Kia's Slovak factory will start production of the new Sportage in July 28. 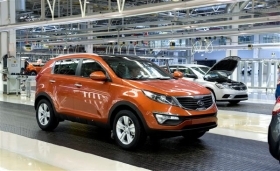 Kia Motors Corp. expects the launch of its new Sportage SUV to help boost output at its plant in Zilina, Slovakia, to pre-crisis levels, the company said in a release today. "We plan to produce more than 35,000 units of this SUV model this year," Kia Motors Slovakia CEO In-Kyu Bae told reporters on Friday at the factory, where Sportage production will start on July 28. Kia predicts that 2010 production in Slovakia will top 200,000 units, up from 150,020 vehicles last year. Production in Slovakia totaled 201,000 units in 2008, before the global economic crisis hit new-car demand. The plant's annual capacity is 300,000 units. The plant makes the Kia Cee'd compact as well as the new-generation Sportage and Hyundai ix35 SUVs. The ix35 used to be sold in Europe as the Tucson. Hyundai Motor Co. and sister company Kia are using factories in Slovakia and the neighboring Czech Republic as a base for sales in Europe. Slovakia's car industry, including assembly plants of Volkswagen AG and PSA/Peugeot-Citroen SA, is a key driver of the heavily export-reliant Slovak economy, which contracted 4.7 percent in 2009 and is expected to grow about 3 percent this year.